With haying over I finally got the fire fighting rig mounted up. I got it new last year at the end of fire fighting season, what planning, and it has never been used. I would like to keep it that way but I know it's impossible. I am going to use it for a feed tank to my sprayer on my 4 wheeler when I am chasing knapweed. I figure it will work good for that. Taken 7/13/2007. My portrait group is doing Cowboys and Native Americans today. I'm wondering if there is a politically correct term for Cowboys? Also, knapweed is everywhere. I get in trouble for running over it with our lawn tractor and spreading the seeds. Husband is out pulling them left and right. It's insidious. Smoke in the air here in Helena, not sure where it's coming from. Loved the story! Your fire wagon is more mobile than ours is. 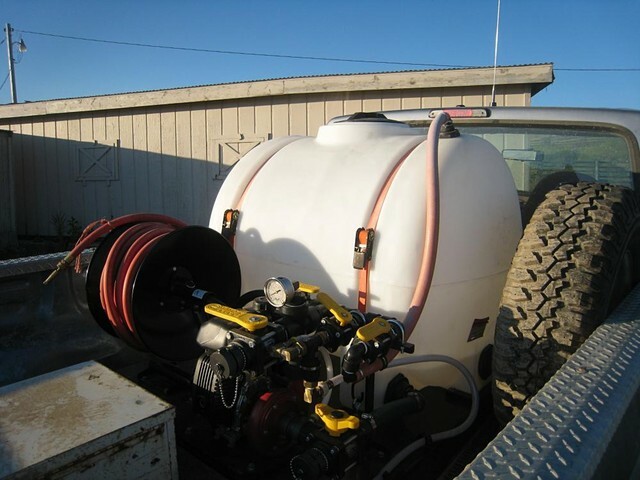 We have a 1200 gallon tank on a fifth wheel trailer with a honda pump. We also multitask it to haul water other than for fighting fire. We're generally pretty flat around here and haven't had issues going where we have too but I envy your mobility anyway! We don't seem to get the nasty knapweed here. 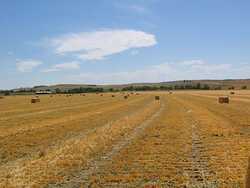 Not many farmers and the hay stays fairly local so they haven't trucked it in. Babys Breath is a probalem in the sandy areas though. It's rough enough around here you have to have mobility when your acting as a fast attack responder. I know guys that have 300 gal sprayers and they are handicapped when trying to get around. I wanted something a little smaller. How the knapweed got started around here is a mystery. The favorite theory is a guy just east of us used to bring in yearlings from Western Montana and they brought it in. I remember spraying knapweed on the place the first time in 1972. We had a really big patch, ~100 acres, that we never knew what was until a guy came to work here that was from Western Montana and told us. It's been a battle ever since. We've been using goats for years to control it. Much cheaper, more efficient, plus, you can feed a goat out well on knapweed. Not worth spraying it over here. The County is the worst offender. If they start to make an effort to control it, people will then be able to implement a control program. Fences dont control knapweed from spreading. Baling the last of my "hay." This very mature hay barley finally got put in the bale. Still high in nitrates but I have to get it off the field. Taken 8/12/2006.